I just wanted to pop in and tell you first, what we ate today and second, why we ate that. For breakfast the kids had cereal, powdered donuts and/or apples. I know – super healthy, right?! I was awake half the night because our dog was barking like crazy (for no good reason), so I slept late and they fended for themselves. For lunch we decided to have sandwiches. We usually have leftovers for lunch but there were no leftovers in the frig. After thinking for a minute, I remembered that the bread was getting close to expiring along with some lunch meat that we bought a couple of weeks ago for a football game viewing. I absolutely hate waste, so today was a great day to use up the bread & lunch meat to keep from having to toss it! 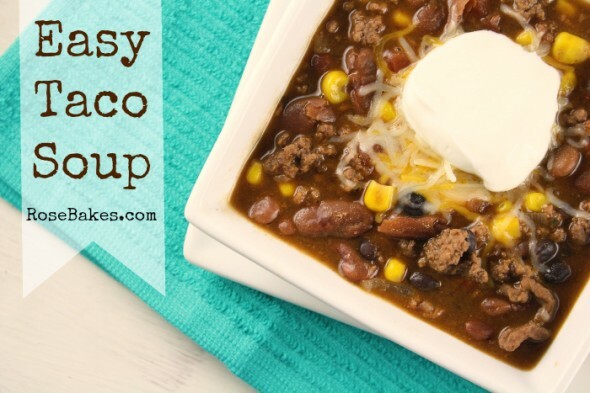 For supper I decided to make Taco Soup (except with cooked dried beans instead of canned). I have a ton of dried beans in the pantry and with my new Instant Pot obsession, I was able to cook 3 varieties of beans in under 2 hours to add to the soup. Also we had some tortilla chips on hand that would otherwise be eaten as just a snack food unless I used them up with the Taco Soup. And that’s that!! Successful day 1. This idea came along at just the right time for my family. My 2 fridges and deep freeze are busting at the seams as well as my cabinets/ pantry. You have inspired me to do my best to use up as much of it this month and get creative. I love being creative in the kitchen. Thanks for the inspiration!